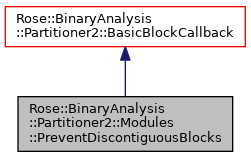 This basic block callback causes the basic block to terminate when it encounters an unconditional branch, in effect causing all basic blocks to have instructions that are contiguous in memory and ordered by their address. ROSE normally does not require such strict constraints: a basic block is normally one or more distinct instructions having a single entry point and a single exit point and with control flowing linearly across all instructions. Definition at line 193 of file Modules.h.